Today was what is known in the local running calendar as Bridge to Brisbane Day. A 10km event starting at the Gateway bridge, going over it (I’m so glad I didn’t research what that looked like before the day! ), before heading towards the City. So many positives for me to take away…..the fact that the local public transport operators put on free extra services at stupid o clock on a Sunday morning, to get just under 17000 (yes that’s right seventeen thousand!) runners to the start line. A fabulous sight sitting on a train (one every few minutes) in the just after dawn hours and seeing nothing but race numbers attached to the front of every lyra/active wear traveller filling every carriage. And then, there was the fact that I ran (well didn’t resort to walking anyway) the whole thing without stopping. Yes I have run 10k without stopping before, but not for a long time, and certainly not when the start was up a long hill. And yes I wanted to stop on many occasion, but after ticking off each kilometre marker that thought of….”come on just one more”… kicked in, so when I got to the 7km marker it turned into the ….. “well you can’t stop now”…..thought. Even when at about 9km, another damn hill appeared…. And I stated out loud (much to the surprise and amusement of several strangers running around me at the time)…. “Oh s##t….Right….Come on S!”. So finish line crossed, T-shirt collected and lots of water drunk, I staggered out into the finish village to check out what was there before heading home (on the free train of course). My favourite sight……the masses of chopped fruit just ready for the taking. Super refreshing and a nice change to the sugary snack bars usually handed out by some sponsor or other. Just the odd bit of fruit! My stats: Finished in a time of 1:14:39, and placed 9885 out of 16784 finishers. Wednesday’s are market days in Redacliff Square, right next to Brisbane’s central shopping mall. Every week a plethora of tasty delights, like fresh fruit and veg, cakes and breads of many varieties, healthy options, salamis, lemonade, nuts galore, jams and honey, and more to take away with you. Of course not to mention the large selection of freshly prepared, before your eyes, mouth watering delights to tempt the senses if you venture that way on your way to and from work….or maybe even a lunch break. In many cities I’ve been to, especially in the main retail areas such as high streets, a lot of the old buildings still stand, but their lower floors are given over to shops or restaurants with their own hoarding aimed at capturing the passersby eyes. But if you take a moment to look up above these ‘modern’ fascias, quite often the old buildings features are still visible, and a delight to look at. Sitting eating my lunch today…..I decided to look up….and I think this building is nice to look at. Sometimes I go to and from work on the train. And often this means going over one of the many bridges over the Brisbane river. City skyline from within a train. Tonight, rather than sit and do things on my phone (don’t we all! ), I thought I’d watch the view. I was luck and managed to catch not only the city skyline, but also Citycats going in both directions down on the river. What views do you get on your commute? I see the Wheel of Brisbane regularly. It has a great spot in the middle of the South Bank parklands, next to the river, opposite the skyscrapers and buildings that make up the city skyline. Tonight, the darkness seemed to engulf everything but it’s white brightness as I walked by. 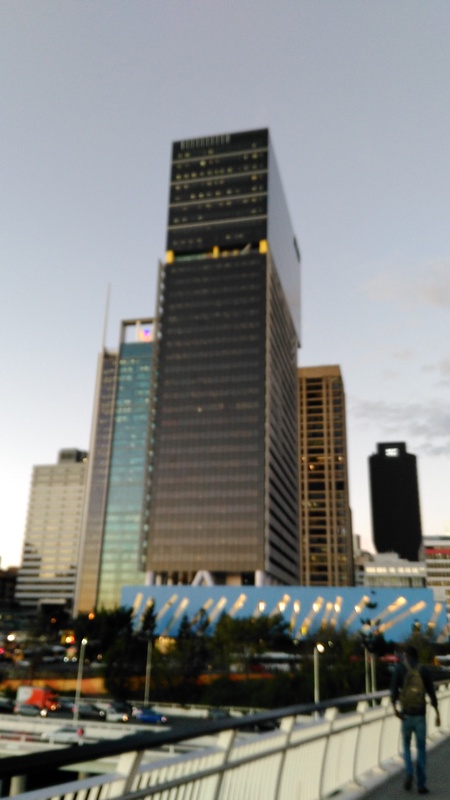 There’s quite a few tall buildings that make up the Brisbane skyline. This particular one is called “Brisbane Square”, houses the Council’s city library in the bottom few coloured pods that stick out the bottom, and will in the coming months be joined by an even taller building next to it. A regular sight for me as it sits next to the Victoria bridge. The one I usually cross if heading towards the city, or most other places on the north side of the river. 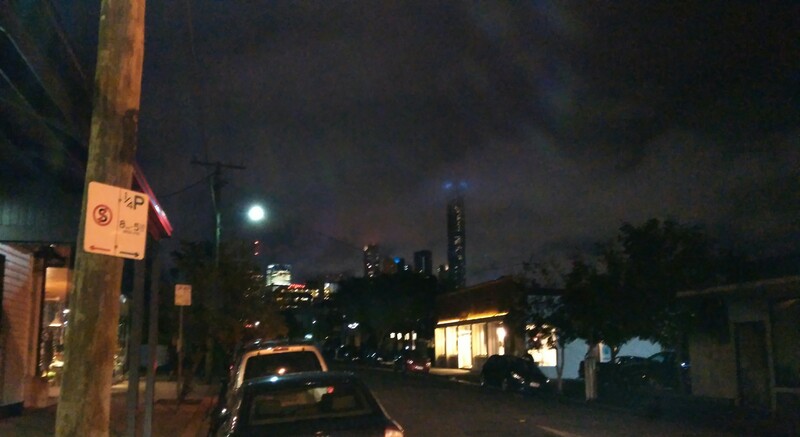 Walking towards New Farm, and looking back towards the city tonight, the view of the clouds enveloping the tall towers was quite eerie.